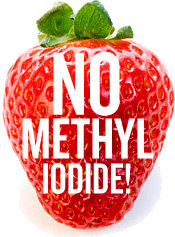 Red Wine, Green Tea and Dark Chocolate: Tell the EPA: No more methyl Iodide! Comment Deadline is Friday April 29. Tell the EPA: No more methyl Iodide! Comment Deadline is Friday April 29. The battle against methyl iodide is being fought on several fronts. Last summer, Washington state banned the use of the pesticide. Unfortunately, the pendulum swung the other way in California, when despite more than 53,000 public comments submitted by CREDO activists and our allies, the state's Department of Pesticide Regulation approved the chemical for agricultural use last December. But the ultimate power to regulate pesticides lies with the U.S. Environmental Protection Agency, which has just decided to reconsider its approval of methyl iodide — approval that was granted during George W. Bush's administration. This is our chance to finally ban this toxic chemical from being used as a pesticide on our food. But we must act quickly. Friday April 29, 2011 is the deadline!